Random House Books for Young Readers, 9780449815663, 144pp. 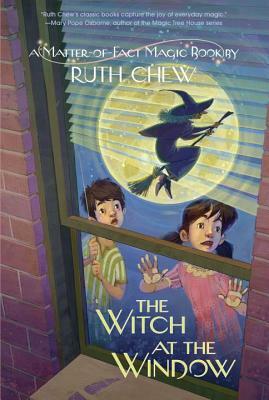 For decades, Ruth Chew’s classic chapter books full of everyday magic have enchanted early readers. Now that they are in print again, a new generation can fall under her spell and fall in love with reading. Why did a witch appear at Nick’s window? Could it have something to do with a mysterious tree in Prospect Park? Ever since Nick and Marjorie discovered it, strange things have been happening. First, they find an odd spoon with no owner. Then a spooky bird follows them home—and talks to them! It must be the witch’s magic! But where has she vanished to? And what is she looking for? RUTH CHEW was born in Minneapolis and studied at the Corcoran College of Art and Design in Washington, D.C. Working as a fashion artist, she started writing stories about witches for the youngest of her five children. The first of these, The WednesdayWitch, was a big hit, and her new career was born. Ruth Chew went on to write twenty-nine tales of magic and fantasy that have enchanted generations of readers.